“Frackonomics” is back! In case you missed our event at Ethical Culture last year, Deborah Rogers and Al Appleton will once again lay out how, in the words of Stephen Colbert, fracking is the “golden goose that is pooping all over the house,” i.e. not so golden as the gas industry leads the public to believe. This Thursday evening, 10/3, 6-8 pm, SVA Theater 333 West 23rd St., Manhattan. 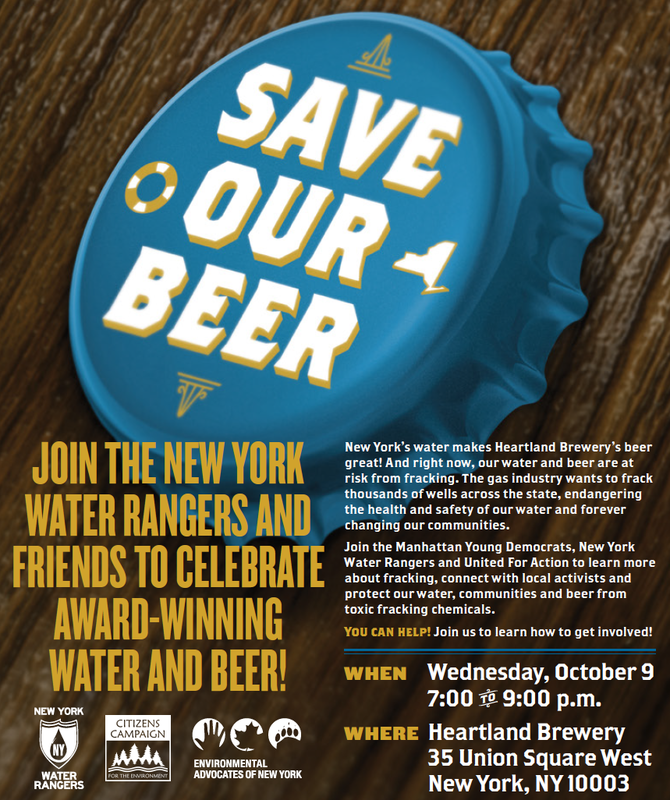 The following week, Wednesday October 9th, join our allies such as Environmental Advocates and Riverkeeper, as well as our “superhero” Mark Ruffalo, as we convene to celebrate our state’s beer industry and reaffirm how we must stop fracking from threatening this and other industries so vital to NY’s economy. The event takes place at Heartland Brewery at 35 Union Square West, from 7 to 9 pm, $10 suggested donation. Finally, mark your calendars for Saturday, October 19th’s “Global Frackdown: Protect NY Food, Milk, Wine and Beer.” While Governor Cuomo celebrates NY food at the Taste NY Brunch at the Chelsea Piers, a coalition of anti-fracking groups will gather outside for a rally and a day of fun activities for children, adults and the whole family to celebrate New York water and to protect New York food. We wish to thank Governor Cuomo for keeping NY frack-free, so far, and we agree with him that we love NY State’s clean water and healthy, tasty food, milk, wine and beer. We wish to tell Governor Cuomo to ban fracking in New York State and to remove all fracking infrastructure from New York State. From 11-3 at Pier 62 on West 23rd Street. Hope to see you at one of these events. As always, we are grateful for all you do to help stop the ravages of fracking.